Welcome to the 2010 Passion For Savings Gift Guide. I hope you’ll take a little time to click around and see all the great gift suggestions. I’ve personally reviewed all of these products to make sure they meet my standards for quality products however inclusion was never promised and these thoughts and opinions are completely mine! I hope you’ll find some HOT Gifts as well as Gift Ideas for those hard to Buy for people on your list. Just check out each Category to see This Year’s Top 10 Holiday Gift Ideas! Also, don’t miss the HOT Holiday Deals Section for the best Gift Ideas and Deals available today! The Poppy Clutch by Amy Michelle Bags is a great item for moms who are looking for both style and functionality. With a great patent leather look you can use this bag for diapers during the day or take it out for a night on the town. The strap attaches to the stroller for easy on the go access. You can purchase the Poppy Clutch by Amy Michelle Bags for only $49.95. What I love: I loved the look and feel of this product! I would NEVER guess that this bag was meant for an on the go diaper bag. This clutch also has lots of space for your wallet, make-up or yes, even diapers. I’m always a big fan of things that have more than one use because you get more for your money and you have to buy less ‘stuff’. The Pearl Source is a great way to purchase high quality items at a big discount. The Holidays (Christmas and Valentines included) are one of the most popular times to purchase Jewelry and it’s hard to know if you’re getting great quality when purchasing online. I have to admit I was a little skeptical of the great prices that The Pearl Source offers, but I was SO impressed with the quality and presentation of these pearls. They are beautiful and even included an appraisal so you can see the value you’re receiving. What a great way to give a high quality gift for less. You can purchase the Black Freshwater Pearl Bracelet for just $135 (This is a $540 Value) from The Pearl Source. What I love: These pearls have a great look and feel. I picked the Black Freshwater Pearls to share with you because I thought they were a little less traditional but still beautiful and I don’t really think the pictures do justice for this item. You can purchase the Clarisonic Plus System for $249 and when you purchase the pink system a portion goes to Hope Is Beautiful, a program supporting women with breast cancer. What I Love: The Clarisonic is completely waterproof and can be used in the shower so it doesn’t really take an extra step or any extra time. In just 60 seconds a day once or twice a day you can have cleaner, healthier skin. The Clarisonic Plus has 3 speeds and 2 heads for cleaning either the face or the body. I also LOVE that the Clarisonic plus has a built in timer where it beeps every time it’s time to change positions. You use it on your Forehead for 20 seconds, at the beep change to your nose/chin area for 20 seconds, at the next beep go to one cheek for 10 seconds, at the beep change to the other cheek for 10 seconds and you’re done. It’s so easy and convenient. (And if you want a little secret, even my husband has started using it :) That should tell you just how great it is). Sportline’s advanced continuous Heart Monitor. With On-Demand Heart Rate Monitoring the Duo has all key heart rate functions and also Speed, Distance and Stride Tracking as well as Fat-Burning Monitors and Zone Trainers. You can purchase the Sportline 1060 at most major sports retailers or online at Sportline.com for just $119.99. What I Love: This watch monitors Fat-Burning, Distance, Speed and your Heart Rate all at once. I actually wish I had known about this when I was pregnant and worried about exercising while watching my heart rate. This would have made things so much easier. I also love the white, because White Watches are the “In Thing” right now, but you can also get this same watch in black. I also loved how easy this is to set up and get started using. Blue Avocado offers a great line of Reusable Totes and Lunch Bags. These are perfect for moms who do a lot of shopping but still want a fashionable & eco friendly alternative to all those plastic bags. You can keep all of these bags ready to go in the back of your car and then when you get ready to shop you already have them ready to go. I also love using these bags for returns, it’s easier than trying to remember to save a store bag and when you get done with your returns you have a shopping bag :) Blue Avocado bags are one of my favorite lines of reusable bags. You can purchase the Starter Pack or Lunch Tote on BlueAvocado.com. What I Love: The quality of these bags is unmatched. I’m not really a fan of the normal reusable shopping bags that you find at most stores because they are just not very strong sometimes. The Blue Avocado bags are really well made and super cute! These would make a great gift for teachers too! Or someone who works would love the lunch tote. By now you know that I am a huge fan of Mom Agenda products. I really try to include different products for you each time I do a gift guide, but I just couldn’t leave this one off. I use my Mom Agenda Planner all the time and all year long. It’s one of the most practical gifts you can give. Mom Agenda Planners are made for busy moms organizing multiple schedules. They are small and easy to carry and perfect for throwing in your laptop bag or diaper bag :) Check out MomAgenda.com and look at the Desktop Planners. Right now they are 30% off and you get Free Shipping! What I Love: You can keep track of everything in one place. I’m actually using the Personal Portfolio right now, but the Mom Agenda Desktop Planner includes the same sheets. You can track Meal plans, Daily Appointments, Monthly Appointments and more all in one place! Plus they are on sale right now, gotta love that! The Miche Bag is a Purse that lets you change the Outside Shell so that you don’t have to move over your contents. If you love to change your purse to match your outfit then this is perfect for you. You can change over the outside shell of this purse and nothing inside moves. These basically work magnetically and they are such a great idea, plus it is so much cheaper to just buy the outside than a completely new purse and think about the storage options since you don’t have to store all those purses. The shells would actually lay flat or fit inside a storage tote. You can check out and purchase the Miche Bag online. Prices start at just $19.95! What I Love: I am way too lazy most days to change out my purse to match my outfit so normally I opt for a neutral or a color so that it doesn’t matter what I’m wearing. But I do love how easy these are to change and that I could literally change them in like 30 seconds. The purses are really well made and it’s hard to even tell that the purse cover is a separate piece. The only problem I had is that my Son kept taking my cover off and on once he figured it out. I love Flirty Aprons. These are perfect for the girl who loves to cook. They also have Matching Mother Daughter Aprons which are so adorable. You can also save 15% right now when you use the code: FLIRTY15 Prices start at just $19.95 right now and you can consider making a gift basket with a few baking items and kitchen utensils. I’m sure it would make a great gift. Check out Flirty Aprons to see all the available styles. What I Love: These are just about the Cutest aprons you will find but my favorite feature has to be the matching aprons for Mom and Daughter. These are also very well made. What I Love: Smashbox Makeup is very high quality makeup but the fact that you are getting so many different colors in one kit makes this a great deal! It’s $260 worth of make up for less than $60 so it’s like saving over $200 by buying the kit. The Sportline 1060 Duo heart rate monitor allows for continuous and on-demand heart rate monitoring. It also has a Digital pedometer which calculates strides, distance and speed. This is the perfect Holiday Gift for a runner or the exercise enthusiast on your list. You can purchase the Sportline 1060 Duo Watch online at Sportline.com for $119.99 or check out the Sportline 1010 Duo on sale at Target.com for just $72.49 with FREE Shipping. What I love: Most of you know I’m all about Style, Functionality and Value and I think this watch offers all of those things. I also think this is great for those Hard to Buy for People on your list. This watch could be for everyday or perfect for running and getting in shape. If you’re looking for a New Years Resolution Item this might be perfect for you. If you’re looking for the perfect gift for mom or dad you may want to consider Vivaz. With Vivaz, you can capture all of life’s special moments in HD video and high resolution photos with an 8.1 megapixel camera. In addition, there is a one-step process to upload videos to YouTube, which makes sharing those special moments quick and easy with friends and family. The Sony Ericson Vivaz is available at AT&T for just $79.99 and would make a great gift. What I Love: This phone has great clarity! I didn’t expect the screen quality to be so clear, It’s also perfect if you use your phone to take pictures as much as I do. With 2 little kids we are always snapping pictures with our phone so I love that this has an 8.1 MegaPixel Camera. The touch screen allows you to easily get around most applications and I personally loved the Twitter and Facebook direct links. Dad’s always love having pictures of their kids and grand-kids around the office and what better way to display all those images than with a Digital Photo Frame. The Omnitech 11″ Digital Photo Frame is just $99.99 this year at Staples. This includes the AC Adaptor and the USB Connector for loading photos. Accepts SD/MMC/MS/xD memory cards and USB devices. What I Love: My dad is always asking for new pictures of the Grandkids there isn’t anything else he really needs or wants at this point in his life, so new photos each year makes him very happy and I know he will love something like this to help him display all those great pictures at once. There’s nothing better than style and comfort together. I know I’m always talking about the “Guy who has everything” but well I guess that’s where we all need a little help right? I happen to have 3 of those guys in my life so I’m always on the lookout for Cool Christmas Gifts I know they will love. I always think of Red Envelope as the place for Unique Gifts and I love that these Cashmere Lined Leather Gloves are only $69.99. That’s a great price for a high quality item that will last for years to come. What I Love: These gloves are so soft both inside and out. Leather always makes for a great glove to wear on cold mornings when you’re driving and these look great with a suit or with jeans and a blazer. They always say the way to a man’s heart is through his stomach so what better way to show someone you care than with a gift basket from Cheryl’s Cookies. 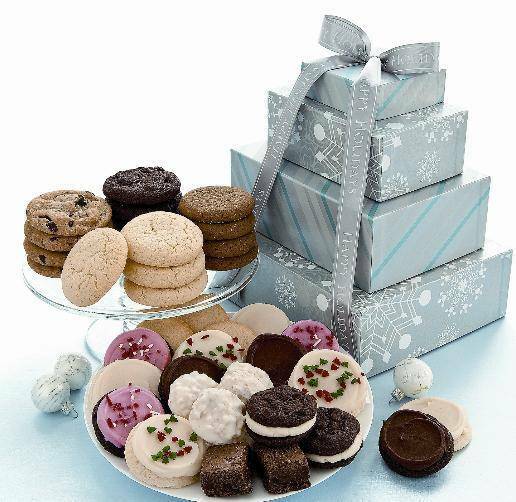 The Shimmering Snowflake Gift Basket includes butter cream frosted cookies, buttercream layered chocolate sandwich cookies, pecan butterballs and fudge mini brownies. You can purchase this gift box and have it shipped directly to the recipient for only $39.99. What I Love: I actually got the chance to taste several different varieties of cookies from several different companies and these by far had the best flavor. I even let Hubby vote because I wanted to give you an honest opinion. My biggest fear with ordering cookies and items online is that they won’t arrive fresh, These showed up and were delicious. I loved that they were individually wrapped because that meant that even the ones that weren’t gone the first day were still as fresh as the first ones. The new Apple TV allows you to Stream HD movies and TV shows rented from iTunes, plus content from Netflix, YouTube, Flickr, and MobileMe to your TV. It’s perfect for the Techy in your life. You can purchase the Apple TV on Amazon.com for under $100. What I Love: Everything in life seems to be going digital. With Apple TV you no longer have to wait to watch movies from Netflix you can download them and watch them on your TV instantly. Similar to watching them on your computer only now you can enjoy them from the comfort of your couch! You can now customize just about anything including the new Custom Case-Mate Cases for your Apple iPhone or Blackberry! What better way to add in a company logo or family photo. These Custom Case-Mate Cases start at around $40 depending on which custom case you choose. You can also create your own design from their collection of designer images! Anther great idea would be to give a gift card and let them design their own case. What I Love: I created my own case to test this out and it was SUPER easy and a lot of fun. I personally think creating a photo case or giving a gift card would be the best ways to use this new technology. These super easy to clean water bottles feature BPA Free Stainless Steel, Non-Epoxy Lined Bottle, which unscrews in the middle to make for easy cleaning. No more worrying about germs in the non-washable bottles, Alex Water Bottles are Dishwasher safe and Smoothie, Powder Drink and Oatmeal Friendly. Use them for just about anything except Hot Beverages the Alex Bottles are perfect if you have an outdoor or sports enthusiast. You can purchase Alex Bottles on AlexBottle.com starting at just $25.95. What I Love: I think the the thing that got me about these bottles is that you can put them in the dishwasher and since they come apart you know they are getting clean. I’ve never been a fan of Stainless Steel Bottles because well they don’t always taste right but I think being able to wash these in the dishwasher gives me that peace of mind. Also, I don’t like paying for bottled water so this is a great alternative. Have you ever wanted to share the music on your iPod? Well now youc an with Rock-It the new portable Vibration Speakers that sticks on any object and turns it into a speaker.You can purchase the Rock It for only $49.99 from OrigAudio and it’s a great gift idea. Plus check out the video of how it works, you’ll be giving hours of fun and entertainment along with it. What I Love: These are really fun to play with I think you can have hours of entertainment just messing around making speakers out of just about anything. The Kindle has gone Wi-Fi and Dropped the price to make it more affordable for everyone. At just $139 on Amazon.com you can get the new Wi-Fi Version of the Kindle with all the same great features like online downloads, account sharing, and Free eBooks! If you have someone on your list who loves to read this would make a great gift, Or maybe a gift for yourself! What I Love: I am always posting Free eBooks available in the Kindle Bookstore. Since these readers have become more affordable one of the things you have to consider is the cost of books. Amazon has the lowest $9.99 per book price as well as the best selection of Free eBooks! What I Love: My Son is almost 3 and this is PERFECT for him. He loves anything that he can set up, build, re-arrange and so on. These pieces are big enough for his little hands, but I love that you can move things around and change up the stunts. If you have a Chuck & Friends Lover in your house then make sure you check this toy out! What I Love: I wish you could have seen the look on my husband and brother in law’s face when they started pulling this out of the box! This is a toy for little and big kids! I think having more than one of these so they could race would have been a lot of fun too. I also love how this changes from a low to a monster truck. It’s perfect for building tracks and setting up stunts. The My Little Pony Gift Sets are so adorable. The Friendship is Magic gift set is based on the TV Show and includes all 5 main characters along with a storybook. This set would make a great gift, but you could also open it up and use the figurines as stocking stuffers as well. You can find the My Little Pony Friendship is Magic Gift Set online at Amazon.com or ToysRUs.com or check out any local retailer. What I Love: I remember playing with My Little Pony when I was little. I think these might just be one of those classic toys that girls will always love to play with. I also think if you have a girl who watches the TV Show this would be a great gift. What I Love: This is more than a standard wood toy which is what I think of when I think of “Green Toys” It has moving parts and pieces only with out the metal axles, wheels, etc. I also loved the Tea Set and the Dump Truck we saw when we were in a Pottery Barn Kids Store recently. This Police Station that converts into a Backpack includes a Police Action Figure as well as a Police Cruiser and and Police Station that converts into a backpack. You could easily take this toy with you since it all contains in itself. The badge has lights and sound as well as hte Police Station. Rated for kids 3 and up you can purchase this online at Amazon.com or check Toys R Us Stores as well. What I Love: I love how this makes a hero out of local policeman. My son has been fascinated lately with Fireman and Policeman (There is also a fireman set) But he can really get into pretending with this and it’s great to watch his imagination run wild. However, I have to admit my son probably likes the backpack more than playing with the toy. The Weebles Treehouse comes with 2 Weebles and it’s such a great toy for little hands. I love how easy all the parts and pieces of this are to turn and handle. The Weebles figures ride up, slide down, spin, and rock while it plays fun music. You can purchase the Weebles Treehouse at Walmart, Toys R Us, and online. This toy is rated for ages 18 months and up. What I Love: My little boy was dying to open this one, I think he loves the colors and letting the weebles slide down the tree house. My little girl loves just about anything with music so this was perfect for her too, although she was a little young for this one. My son could spend hours playing with this one and he’s almost 3 so if you have kids younger than that it might be a great toy they can play with for a long time. Sometimes its the little things in life that make kids happy. I’ve learned that big doesn’t always mean they will continue playing with it after 2 months. But these Bubble Monkeys from Munchkin are perfect for the Bathtub and I don’t know if Kids ever get sick of playing with bubbles. You can purchase these at Toys R Us or Target. What I Love: These are super easy for kids to hold and since there’s 2 and I have 2 kids well, you can get the picture it was nice to have more than 1. Also, these are easy or kids to actually blow bubbles out of. Some bubble containers don’t work very well with younger kids but these are great. Eco Plush Natural toys are made from natural cotton that is untreated, unprocessed, and unbleached. The Dr. Suess Collection is colored with a chemical free PureWaterWash process. You can purchase the Eco Plush toys at Babies R Us stores Nationwide. What I Love: These toys are sooo soft and super cute. We are big fans of Dr. Suess books around our house and my son instantly attached to this one. He loved holding it while reading the books. While participating in the yearly Christmas Play at Church Brother and Sister Bear learn that it is better to give than to receive. This book is perfect for younger kids who are struggling to learn the true meaning of the Holidays. These books teach Character in an engaging way. Your kids will want to read them over and over again. Look for Berenstain Bears at bookstores nationwide. What I Love: Well I’ve always been a big fan of The Berenstain Bears and now my kids are too. These stories are always engaging with such a great message. Also, I love that this book is available right at Christmas time when kids tend to focus on the gifts. What I Love: This Kitchen is perfect for all ages. I also love that it’s not specifically a Girls Kitchen because if you’re like my family you know that your Little Boys will love it just as much as your little girls. I also love all the storage space and the moving appliances. Learning to ride a 2 wheel bike can be challenging for kids but Performance Bikes new Kids Balance Bikes are making that task a little bit easier by designing a bike that teaches your little one coordination, balance, control. Balance Bikes make learning to ride a bike easier for your little ones. You can check out the Size Chart Here. The Performance Balance Kid’s Bike is just $59.99 right now! What I Love: I can still remember my Dad teaching me to ride a bike and I would have loved to have had something to make that easier. This bike makes it easier for kids to ride and it’s priced at a great price! This is one of those items you can just tell is built well. I also love how this bike will grow with my Son he can learn how to ride on this bike and keep it till he outgrows it. Kids will love Dino Fizz Bath Eggs. They come in several “Spiecies” all in Fun and Fruity Scents. You can purchase Dino Fizz Bath Eggs for around $1.95 on Amazon.com. The Philosophy Warm & Toasty Gift Set includes 3 flavors of Bath and Shower Gel. The Hot Cocoa, Hazelnut Espresso, and My Favorite Hot Buttered Rum are all included and you can give this as a gift, or split it up and use it as 3 stocking stuffers. Purchase on Philosophy.com for only $25! These Eco-Friendly Journals contain 100% Post-Consumer recycled, Acid Free Paper. They also come in adorable wood printed covers. Prices start at just $8 for the Mini Notepads available at Night Owl Paper Goods. This super cute gift set of Mini-Nail Polishes from Sinful Colors is perfect for teenagers and younger girls looking to have a little fun with Polish this holiday season. Colors include Black, Red, Silver, Gold and Green! Purchase Sinful Colors at Walgreens Stores Nationwide. The 7mm White Freshwater Pearl Earrings from The Pearl Source are the perfect gift for mom. I love these pearls on an everyday basis, they just make me feel so dressed up even if I’m wearing my workout clothes! You can purchase pearl earrings starting at $69 at ThePearlSource.com. The Bling Flash Drive from Staples retail stores sells for just $14.99 and this 4GB USB Flash Drive is perfect for teenagers who want style and functionality at the same time. Use the flash drive to transport Documents, Photos or even music. These Silly Bandz Knock Offs are only $1.49 and you can get them in Holiday Shapes which are perfect for stocking stuffers. Shop Shindigz and search for Silly Bandz to find these online. You can purchase a multipack of Hot Wheels Cars and break it up for Stocking Stuffers, or just purchase the individual items which are often on sale at drugstores or national retail stores. This set of 10 Hot Wheels Cars retails for $14.76 or just under $1.50 each!